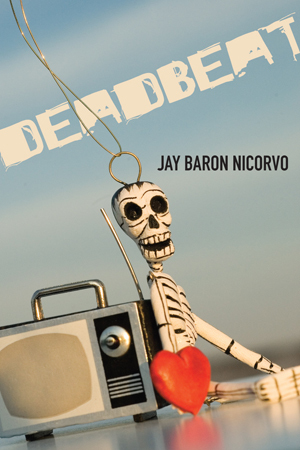 To those of you out there who may have forgotten the details, or are currently available, Jay Baron Nicorvo will be reading at Western Michigan University in the Bernhard Center, Rooms 208-209, at 8pm tonight! In preparation for tonight’s festivities, I decided to dedicate part of my day to rereading his first poetry collection, Deadbeat. —though it obviously would not be fair to the publisher for me to share so many, so I (through gritted teeth) narrowed the selection down to the following five shorter poems (I was aiming for four, and I just couldn’t decide). I hope you find as much enjoyment in them as I do, and I hope you’ll attend the reading tonight! stupid satellite—no halo, no crown. to understand fallen stars in snowflakes? if not an hour, and the moon’s seas aren’t seas. They’re nothing. Nada into nada. Sealess. Deadbeat is a closed window. in the dark windows of a toppled highrise. tells him he’s a bobble-head doll. He nods. a white pump, whim of a beatnik bride’s maid. emptied, as debris fills distance between debris. for a moment, how much space space holds. whish through clots, through plaque. He shakes with the dead skin he sheds. rises, seagull perched—soot and stone. wades into the undrinkable Atlantic. Nicorvo, Jay Baron. Deadbeat. Tribeca: Four Way Books, 2012. Print. our opened black wings.” is from Nicorvo’s poem, “Vigil,” from Deadbeat. Also, after reading “Head,” a shout-out to Robert Creeley. If you’re interested in purchasing Nicorvo’s collection, please visit Four Way Books!